Sunny smiles. A pre-race team shot. 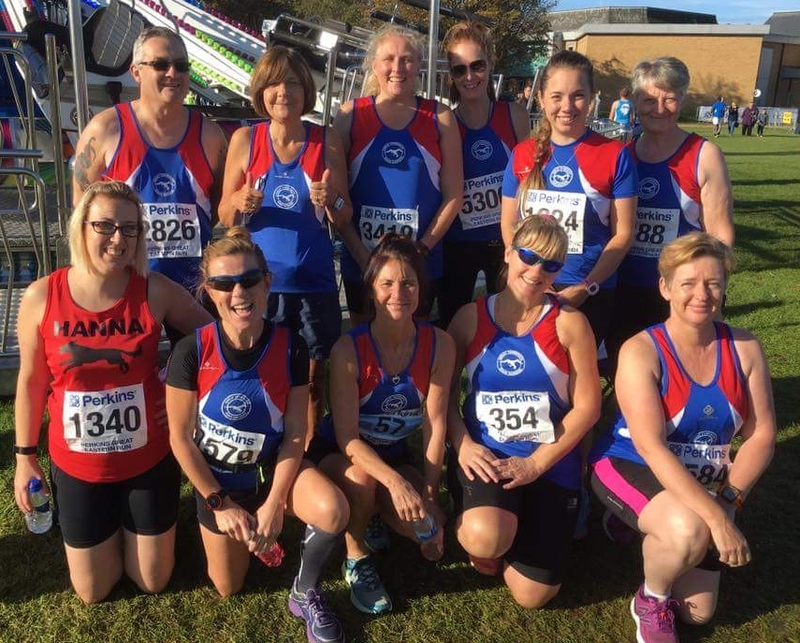 10 GYRRs made the "short" journey across Norfolk and into Cambridgeshire for the Perkins Great Eastern Run. The weather was kind for this relatively flat, fast course and some great times were achieved. First home with a new pb of 1:53:24 was Julie Webster, closely followed by Jane Thomas in 1:55:04. Next was Rob Bailey, first (and last) male with a pb of 1:58:19. Elaine Stone was next in a time of 2:02:21 with Pandora Buck and Gemma Aylen, on her first half marathon, coming in with times of 2:09:24 and 2:10:09 respectively and both achieving pbs. Fellow half marathon debutant, Jenna Kemp posted a time of 2:30:01 with Alison Bilyard a second behind her with a fantastic pb. Vikki Brownsell, also doing her first half marathon in an admirable time of 2:38:43 and Anita Betts finishing in a time of 2:48:33, ensured that everyone made it back safely. It's all about the bling! Well done team. Thanks to Adele Godbolt and Mark Watling for providing the cheers near the finish line. They, along with the majority of the residents of Peterborough made sure this was a great day.